What’s going on with these words? Something weird. That’s odd. We typically see something praiseworthy about people who refrain from exaggerating their achievements or throwing them in others’ faces (although this often leads to people being unwilling or unable to accept any credit for their good works, for fear of seeming arrogant). We talk about being humble (as Indiana Jones tells us, “the penitent man is humble before God”). But people say it feels horrible to be humiliated, it’s rude to humiliate others, and we work really hard to avoid humiliation. Are these words referring to the same thing? Does being humiliated lead to the same end state as choosing to be humble? Or are they different? I guess it makes a big difference whether you’ve chosen humility for yourself or been forced into it by others. Actually, that’s true of a lot of things. Interesting…I had never thought about this. All of these words have the same root. 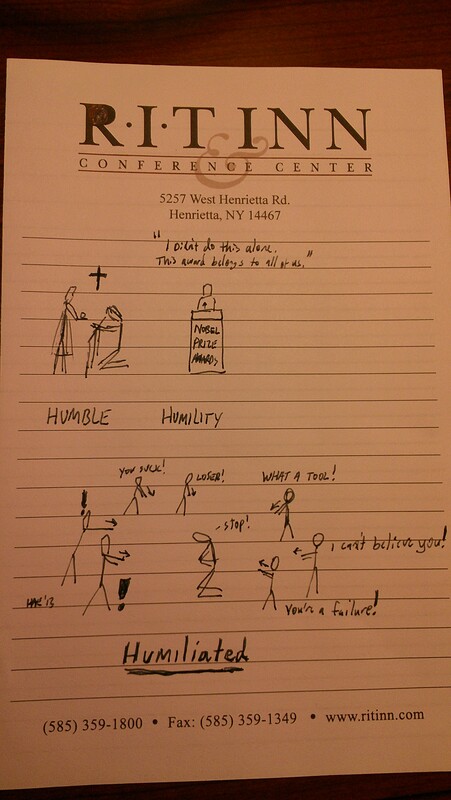 I talk to some of advisees a lot about cultivating humility. I’ll have to think more about that. Humble is a lower state of status or affairs. Humility is acceptance of the lowered state compared to others. Humbling is the circumstances that cause a person to be lowered in status. Latin origin Humilio means to abase. That is to bring down to the base components.